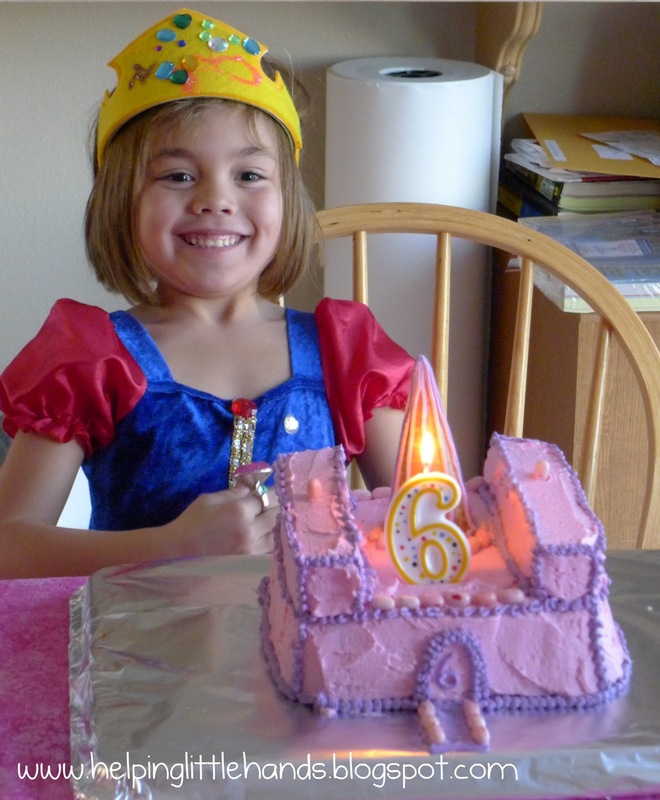 Firecracker requested a princess party for her birthday. Internally, I groaned a bit because princess is so typical...but it was HER birthday, and it was a reasonable request. She would have loved to have Disney princesses plastered all over, but Hubby and I are just not all that in to licensed characters and I didn't want to pay extra for licensed products. I was going for a more generic princess theme. I have to say it helps a lot that Firecracker is in love with pink and purple and her birthday takes place in the month leading up to Valentine's Day. 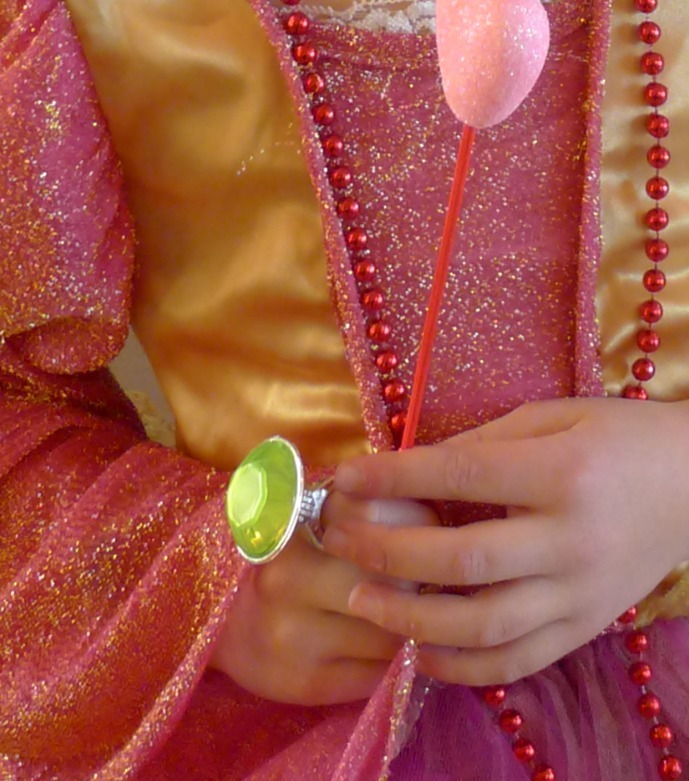 If you'll be throwing a princess party later in the year, you might want to stock up on a few things now. I hit the dollar store (Dollar Tree) first to see what they had in stock that would come in hand. I came home with an 8 pack of huge plastic rings, a six back of headbands, a 10 pack of cheapy bright colored neckaces, a 12 pack of heart shaped bracelets, a 7 pack of glittery styrofoam hearts on sticks, 2 packages of pink "money," and some cute square frames with gold trim. After the dollar store, I stopped by Wal-Mart to pick up some peel-and-stick plastic jewels (one pack of larger jewels and one pack of smaller ones), some glitter glue in assorted colors (Elmers 10 pack), and pony beads with and without letters on them (Firecracker chose glow in the dark ones.) 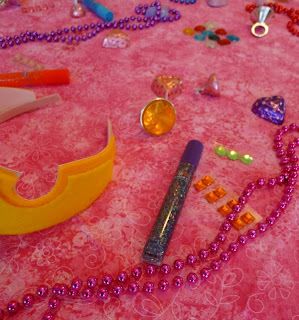 The jewels got completely used up, but we still have lots of glitter glue and pony beads left for other projects. All the princess jewelry was laid out on a bright pink table cloth, so they could pick and choose which ones they wanted, as well as the supplies to decorate their crown. 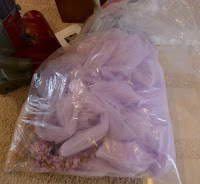 I also sprinkled around pink and purple chocolates that I bought out of the bulk bins at Winco. (I tried to find ones that looked a little less Valentine-ish. The girls' oohs and ahhs when they walked in the door from school said they were plenty impressed with all the dollar store trinkets. 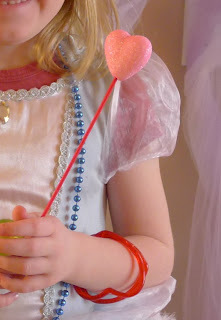 We invited girls to wear their own dress-up clothes if they wanted to, or they could borrow ours. Since we live right across from the school and the girls came directly from school, some of them brought their own clothes to change into and a couple borrowed extra dresses we had. Either way it was a fun way to set the mood. They also got to add the new dollar store jewelry favors to their outfits to feel extra fancy. 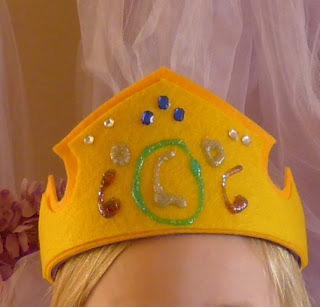 I used the directions on DisneyFamily.com for making Aurora's crown because it was a nice basic crown shape. 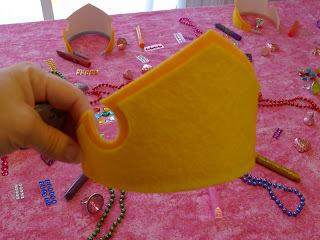 We used felt stiffened with cardstock instead of craft foam and then I hot glued that to a head band. 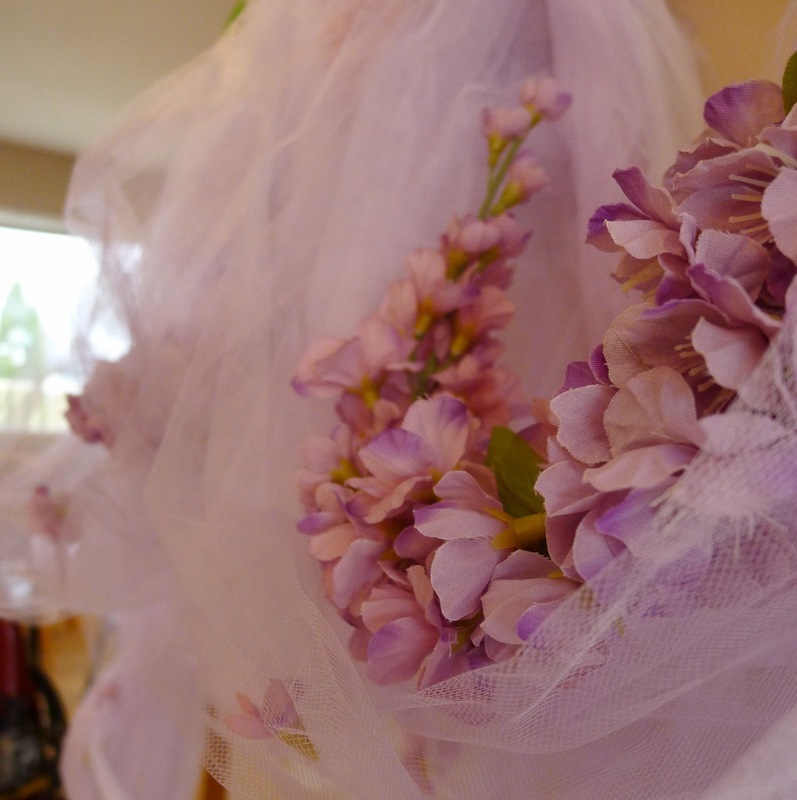 I had the crowns assembled for the girls before they came. The self-adhesive jewels worked great. They also loved the glitter glue, but we had a few issues with it running. 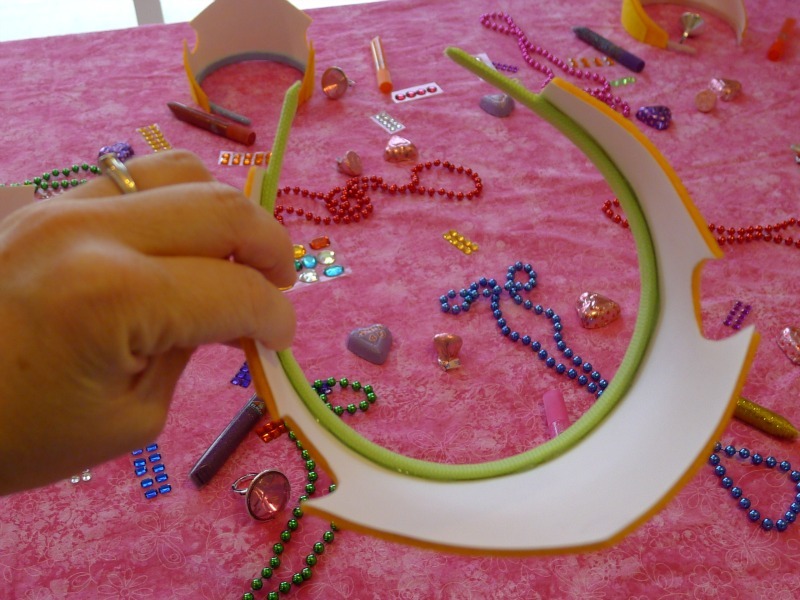 By the end, we stretched the headband around a box to hold it level until the glitter glue dried. 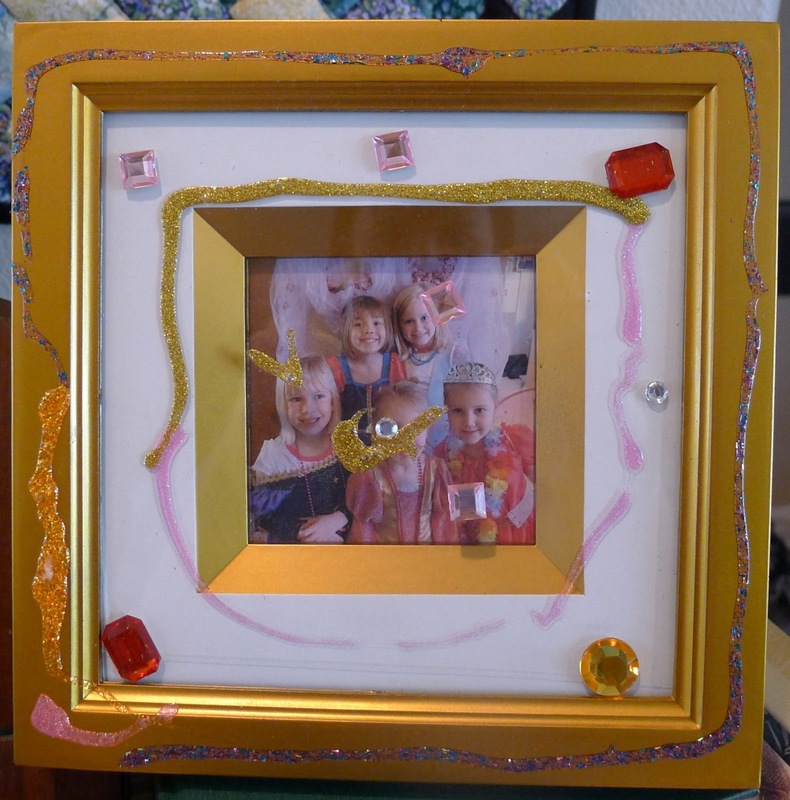 I'd originally planned to make these from craft foam, but when I saw these golden frames with the golden edged mat at the dollar store, I couldn't resist the real thing. These were the big ticket favors at $1 a piece for each girl. 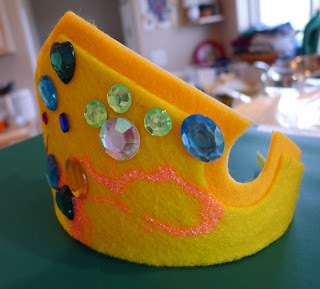 We used the same jewels and glitter glue we'd used for the crowns. I wished I'd taken a picture of all the frames because they were each so different, but here is Firecracker's. 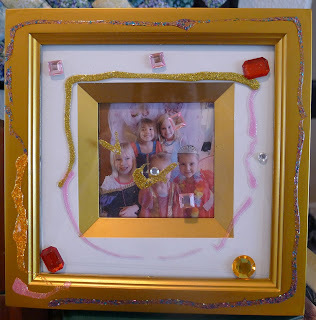 Some girls just used jewels around the edge, some used mostly glitter glue, and as you can see here, Firecracker chose to embellish the glass. Some girls were really precise...and others not so much. I'm so glad that Firecracker has so many fun classmates this year. All these girls are in her class, with the exception of one who just comes in for reading. There was also another little girl at the party who was so busy playing with toys, she didn't want to come for the picture. Ahead of time, I'd set up a background for taking photos against. 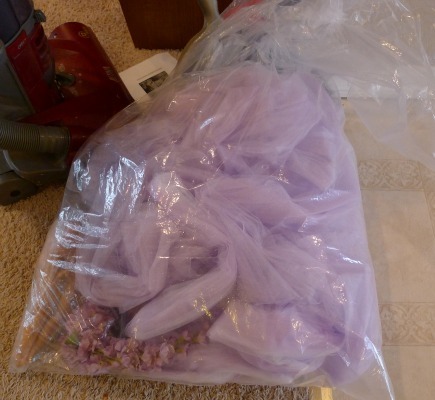 I found a bag of purple and white tullle, complete with matching tacky fake flowers for $2 at Goodwill. I just draped it up on our art board. It looked a little funny on it's own, but it turned out to be a nice backdrop for princess pictures, and the girls thought it was fancy. 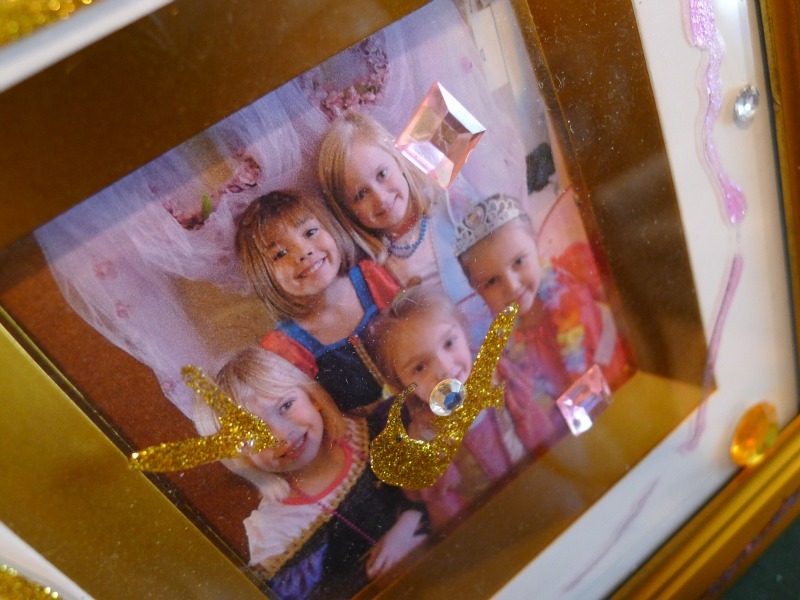 My intention had been to send each girl home with a princess picture of themselves, but when I went to print them, they all opted for the picture of them with their friends, so I sent them home with one of each. I printed the pictures during the party, just on regular cardstock. One thing I've learned is little girls like things personalized. 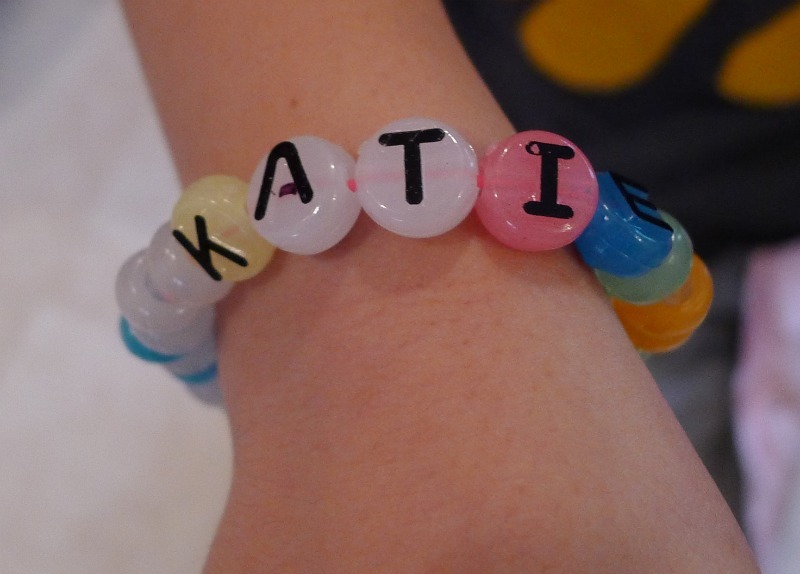 I bought some alphabet beads and matching pony beads, and let them design their own bracelets. 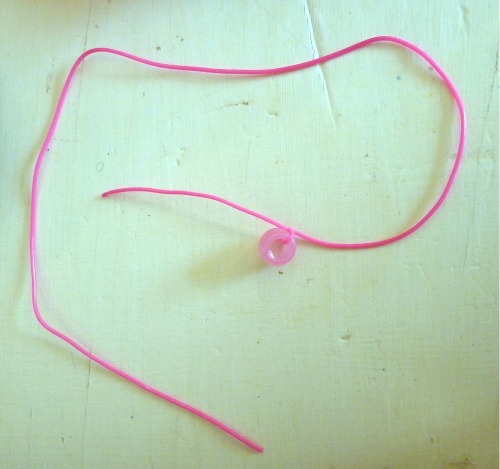 I cut the elastic cord and knotted one bead on ahead of time. That way I figured we'd have fewer nearly finishing bracelets having their beads fall off. The dollar store came though again for this one. 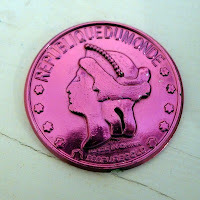 Fake coins were on my shopping list, and the dollar store had pink ones! Hubby hid the coins throughout the house for the girls to find. They loved it. We probably could have had a prize for the one who found the most, but we just let them keep the coins instead. Some girls ended up with a lot more coins than others, but they were all really sweet about sharing with each other to even them out. Besides the castle cake, we also served strawberry lemonaide, and strawberry ice cream. If anyone has read Pinkalicious, they know these girls probably should have turned pink (or even red!) after eating all these pink sweets. They probably weren't all that hungry for dinner. We served the food with the Goodwill teacups and a few other odds and ends fancy looking plates and teacups. The girls had fun eating on "real" fancy dishes...although if I didn't already have them on hand, I would have used paper plates. All of this, as well as opening her gifts filled up about an hour and a half. By then the girls were ready to just play for a little while without an organized activity, so they played for about half an hour and by then their parents came to pick them up. Overall, I'm really happy with how the party turned out for not much cost or a lot of effort. I figured the whole thing cost around $30-35 for 6 girls. We also have a lot of things (ice cream cones, beads, glitter glue, etc...about $10 worth) left over for other fun projects. This is a GREAT party. I am really impressed. 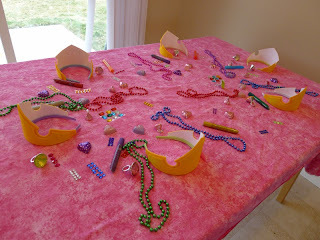 I can tell the girls had a great time--I love all the creative things they got to do. About gifts--I don't think people are bothered to have their child take a birthday gift to another child. Maybe I'm behind the times (and expenses?) since my children are all in their 20s and 30s now, but I don't think that people don't hold out expectations for gifts to be expensive. It's a tradition that allows children to experience sharing, selecting a gift for a friend, and the joy of giving it. Mixed with that is the excitement of watching a friend open a gift from you--a nice little moment of happy drama--with the angst of watching someone else get to do all the opening...knowing that your birthday will come along and then YOU get to be the one doing the opening. I think it's a good social experience for children. Super awesome party. What a lucky girl! And it looks like all the other girls had a blast too. 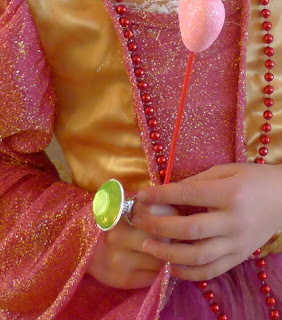 I think you did a great job following though on the "princess" theme request, but still making it super fun and involved (as in, they got to do a lot of great kid activities). Also, I don't feel like I have a lot of great insight on the whole gift dilemma, but I like what Mom said. And I also really like the idea of having my own kids give handmade (or at least semi-handmade) gifts, either ones that I make when they're really young, or ones that they can make themselves. Mostly because I think it would be more meaningful, and way more cheap. I know what you mean about the present side of parties. We recently had a party at home and I actually forgot that people would be bringing presents until they arrived at the door! I think people would feel a little uncomfortable at turning up at a party without a present, I know I would and for the birthday child its all part of the fun. Maybe you could say something about homemade/recycled preloved/price limit on the present. I keep it simple. A cake, some refreshments and something to eat, baloons...but I never told 'do not bring presents'. I don't expect expensive gifts but, for a child (well, and for aan adult too!) it's part of the fun getting presents! A book, a simple toy but a present! I never went to a birthday party without a gift, even for an adult, so I expect the same! Your party looks fun and your birthday girl had a marveillous time for sure! Congratulations!! good job! this turned out fantastic! 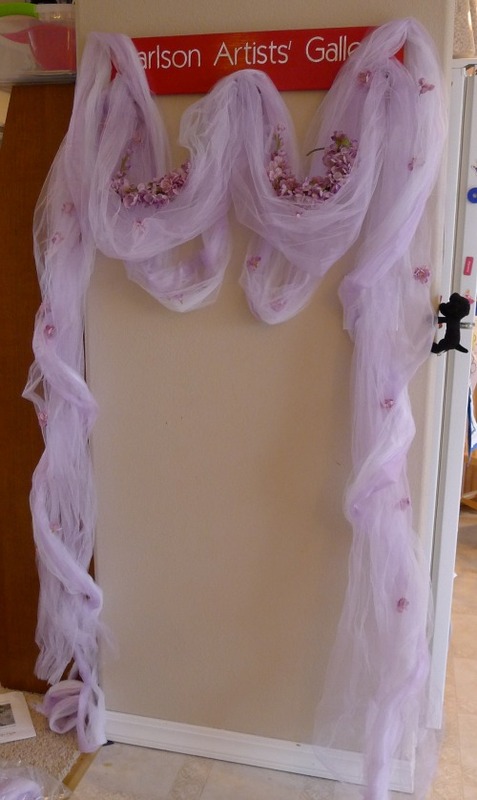 Nothing like making something pretty and staying in budget! What a great birthday on so little money! I love it. Bear is already asking for a Little House themed party. 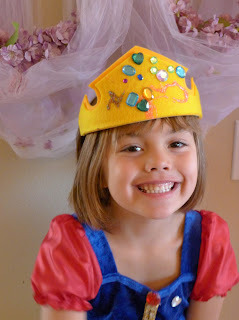 We've been to so many princess parties that I will be happy to host something different! What a fun princess birthday party! My little girl is turning four in a few months so I'm looking for fun and inexpensive ideas. I love your crowns! And I know what you mean by not wanting licensed Disney characters all over your party! I had the librarian compile a list of wanted books, and had the kids bring a book to donate to the school. It can also be done for play ground things; pails, shovels, etc. We also have attended parties and were asked to bring food for a local food pantry and blankets for the animals at the humane society. This is absolutely adorable. I love those crowns! I have a linky party on Saturdays and I'd love it if you linked up! What an awesome party! The little girls musthave been thrilled! Great Party! 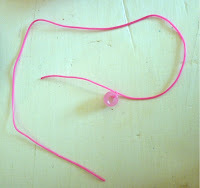 I am about to have one next weekend for my little girl...Tangle themed. As far as gifts from others that are invited to your party maybe on the invitation somewhere ask them to limit the amount spent to say $5.00 if there is a way to put it on there nicely. That way firecracker still gets gifts from her friends, but there is a little pressure taken off of you and the guests that are coming. Great party! My daughter is really into princesses and she'd love this one. I've featured it on this week's Crafty Soiree, thank you for linking it up! How fun. 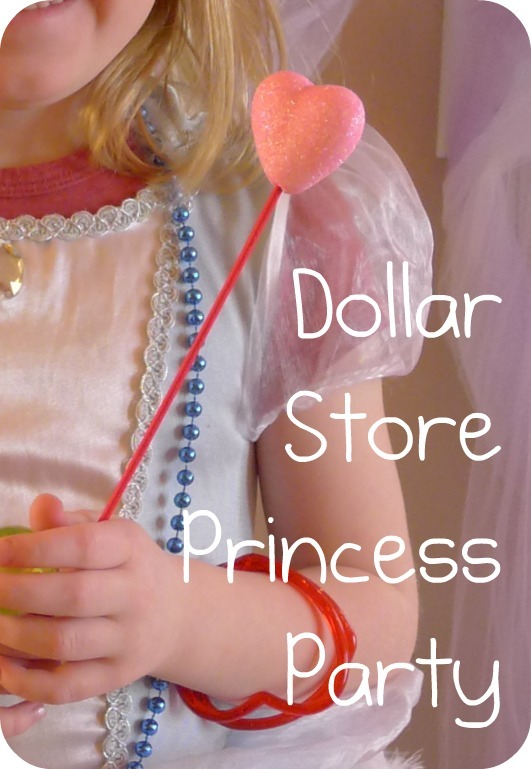 I love princesses and dollar stores! Sorry the link was outdated. I've updated the link now, so it takes you to the pattern for the crown.